Windows 8 is passing two big milestones this week. On Thursday, Microsoft released its quarterly financial results, and hidden inside the numbers are clear indicators of the new operating system's impact on the company's bottom line. Tomorrow, meanwhile, marks the three-month anniversary of Windows 8's October 26 release date. The world has had plenty of time to live with the new OS, and now we can more comfortably score whether it's a success or failure. Has the OS stepped up its game since our none-too-cheery one-month progress report? Let's just say that Windows 8's school grades still aren't quite meeting expectations. The multi-billion dollar question: Are people actually buying Windows 8 and Windows 8-powered laptops, desktops, and tablets? The answer's far from cut-and-dry, because Microsoft refuses to provide many concrete details. The company's quarterly earnings report showed the Windows division earning $5.88 billion in the holiday quarter, a staggering 24 percent increase over holiday 2011, but Microsoft maddeningly refused to provide specifics beyond that total. We still have no idea how many Surface tablets are in consumer hands, for example. At CES, Windows business head Tami Reller said that the company has sold more than 60 million Windows 8 licenses—but that figure includes licenses sold to manufacturers like Dell and Lenovo, making it an unreliable tool for figuring out whether everyday people are actually buying Windows 8. Microsoft has kept consumer sales details about Windows 8 and the Surface tablet close to the vest. Third-party research firms paint a dreary retail picture. Computer sales have actually dropped precipitously since Windows 8 hit the streets. NPD reports that holiday sales of Windows notebooks dropped a whopping 11 percent in 2012, while both Gartner and IDC say that overall PC sales dipped in the fourth quarter by an estimated 4.9 and 6.4 percent, respectively. Net Applications says Windows 8's user adoption lags behind Windows Vista's. All that corresponds with talk from executives at HP, Acer, Asus, Fujitsu, Newegg, and others, who have universally said that Windows 8 is off to a slower-than-expected start. "To really know the state of Windows 8, Windows Phone 8, and Surface, additional granularity is required," says Patrick Moorhead, founder and principal analyst at Moor Insights & Strategy. "We really need to know how many Windows 8 licenses and Surfaces sold through retail. The biggest unknown is why Windows 8 revenue looked good while all [manufacturers] had shaky quarters." Software sales of Windows 8 will no doubt slow going forward as the pricing of a Windows 8 Pro upgrade is set to increase from $40 to $200 in February. Windows 8 has also largely been a dud in the enterprise arena, a few large exceptions aside. When Reller was asked about enterprise adoption of Windows 8 at CES, she explained how BYOD Windows 8 devices should work just fine alongside a Windows 7 deployment. We found the modern interface different, but not overly burdensome. To hear the online masses screaming it, however, in the context of Windows 8, "UI" might as well stand for "unintuitive." It's true that Windows 8 and its hidden controls aren't nearly as user-friendly as Windows 7 out-of-the-box, and since usability complaints have stayed vociferous since launch, we can't grade this highly. You'll get the hang of Windows 8's interface eventually, though—assuming you give it a chance to grow on you. 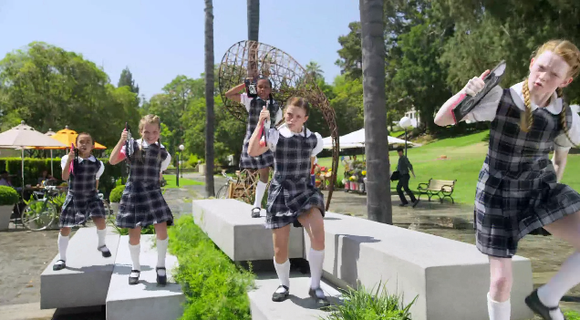 Microsoft has blanketed the world with pop-up stores, Windows 8 ads, and that catchy Surface tablet commercial with the borderline-creepy dancing schoolgirls. (Seriously, look at their faces!) The company's advertising efforts have been utterly slick and nothing short of stellar at getting the Windows 8 word out—though they've been less impressive at imparting the differences between Windows 8 and Windows RT, as Samsung recently emphasized when it declined to launch its RT-powered Ativ Tab stateside. Those dancing girls are part of a superb advertising blitz by Microsoft—though they sure are serious about their Surface tablets. The public reception to Windows 8 has been thoroughly mixed, if not quite completely downcast, and Microsoft's refusal to break omerta about usability concerns and sales numbers have led to an abundance of negative press and feverish analytical hand-wringing. To top it off, the surprising departure of longtime Windows prez Stephen Sinofsky just two weeks after the launch of Windows 8 cast a dark cloud of negativity across an operating system many already regarded (rightly or wrongly) with skepticism. In short: We've been impressed to see such heavy Windows 8 branding appear in NFL football broadcasts—talk about a premium marketing spend—but it's clear the Microsoft media blitz hasn't been delivering ROI. All those colorful live tiles on the Start screen are generated by new-style Windows 8 apps—apps found exclusively in the official Windows Store. Heck, Windows RT tablets only run new-style Windows 8 apps. That makes the Windows Store the Atlas of the Live Tile-equipped world, hoisting an entire ecosystem of expectations on its back. Unfortunately, the Windows Store is a very, very mixed bag. On one hand, the app library is growing at a decent clip, going from 5000 apps available worldwide on October 26, to 20,000 available one month after launch, to 39,153 apps available as of January 23. (The first two checkpoint totals came courtesy of analyst Wes Miller's now-defunct WinAppUpdate.com; the latest total was taken from MetroStore Scanner, another Windows 8 app-counting website.) A small handful of big-name apps have hit the Store in the last couple of months—including Dropbox, ESPN, Vimeo, and Yahoo Mail—and the e-shelves are getting just packed enough that we were able to compile lists of the best Windows 8 music, video, gaming, travel, and business apps. The Windows Store's selection is steadily improving but its still has an abundance of dubious apps, many of which are designed to mimic the look of more popular programs. It took some deep digging, though. Both the overall quantity and quality of apps available in the Windows Store disappoint when compared to competing mobile ecosystems. Many notable big-name apps are still missing. Many of the apps that are available are quick-hit repackagings of Web apps or otherwise insipid fare, and even the best modern-style Windows 8 apps generally aren't as full-featured as their desktop counterparts. 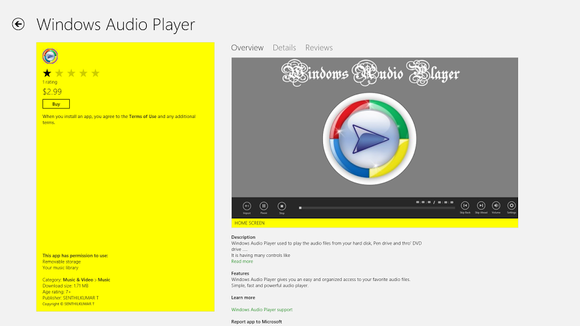 The Windows Store still doesn't do a good job of pointing users towards particularly awesome apps, either. More worrying, MetroStore Scanner's data shows the pace of new app submissions grinding to a crawl. After hitting the 20,000 app mark near its one-month anniversary at the end of November, the Windows Store smashed the 35,000 app barrier on December 27. Between December 27 and January 23, however, only around 4000 new apps were added to the marketplace. That's bad news for Microsoft, which needs exponential catalog growth—including a surge in high-quality apps—if it wants the Windows Store to be a selling point for the operating system. Microsoft isn't blind to the fact. "While the number of apps in the Windows Store quadrupled, we clearly have more work to do," ZDNet reports Microsoft CFO Peter Klein saying during the company's quarterly conference call. "We need more rich, immersive apps that give users access to content that informs, entertains, and inspires." In our one-month report card for Windows 8, we urged patience. After such a harsh holiday season, there's the tendency to panic, but Microsoft still cautions that this OS was built for the long haul, not the short term. "Clearly with a project this ambitious, it's not just one selling season, it will be the product of multiple selling seasons, and more progress to come," Windows business head Tami Reller said at CES. She's right, of course, and her comments are echoed by Wes Miller, an analyst at Directions on Microsoft. "It’s still early in the game, and Microsoft is pretty dedicated to making this happen, and will continue advertising to try and make it so," he told me via email. Windows 8 still has breathing room. Both Gartner and IDC expect at least 350 million PCs to ship this year, and the overwhelming majority of those will ship with Windows 8 installed. Better yet, Windows 8 is faster and better than Windows 7 under the hood, and many of these lackluster grades could easily be improved with some minor tweaks. The Windows Store will only get better as time goes on. Many of the usability concerns could be squashed by releasing an update that restores the Start button and enables and option to boot straight to the desktop. If Microsoft does all that, a lot of the negative reactions currently bandied about could disappear overnight, leaving Windows 8's promotional future in the capable hands of those oh-so-slick TV commercials. Sure, Windows 8 may not make the dean's list quite yet, but if Microsoft pays better attention and does its homework, the operating system could still be honor roll-bound in the future. Windows RT, on the other hand, teeters on the brink of disaster—but that's another story.